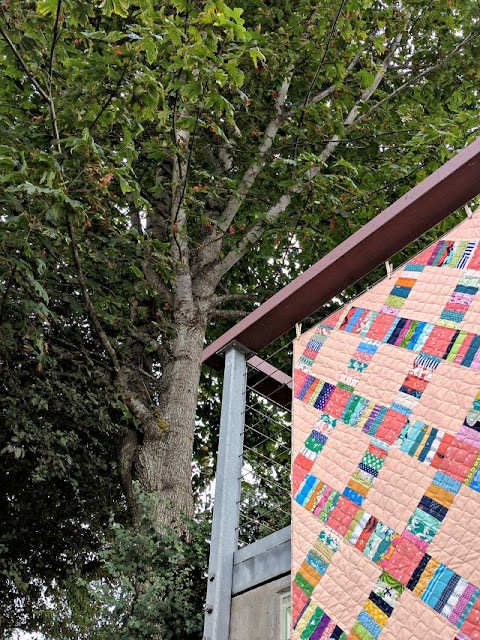 Back in June (duh) I joined the #junequiltqal hosted by Amanda Jean/crazy mom quilts, with my annual summer goal of lowering the level of the scrap basket. I liked making the little slabs, and they went pretty quick. Even though this quilt uses oodles of scraps, there was also alot of other fabric that went into the background and cornerstones. 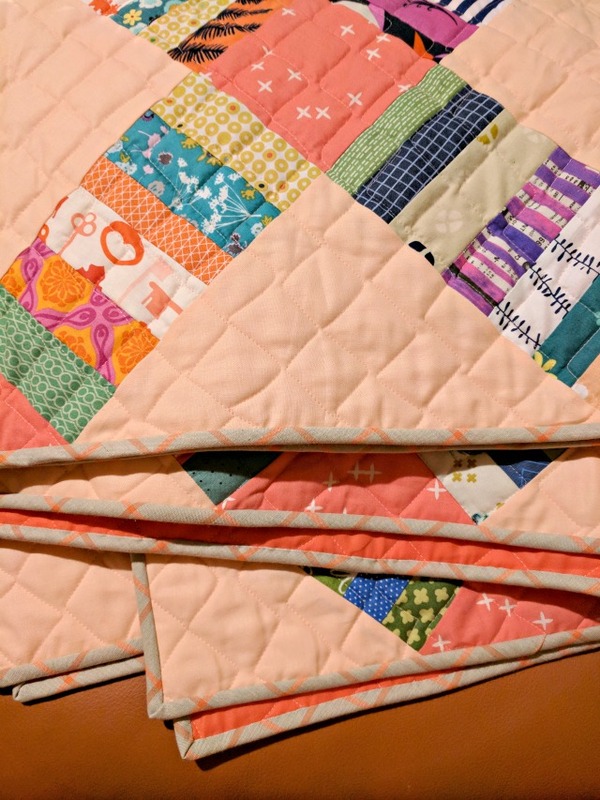 I did purchase those fabrics just for this project and actually made choices that really surprised me but I felt were suggested by the fabrics in the scrappy quilt blocks I'd pieced together. For background, Kona Ice Peach won the honors, and one of my new favorites was picked for the cornerstones - Wink in Coral from Birch Fabrics. Backing was another surprising choice - a Luxe 108" Wideback in Coral from Michael Miller Fabrics. There was no way I was going to piece a back for this one, and when I surveyed my choices in widebacks, this one just seemed to 'fit', bright and bold as it may be. So I contacted my guild buddy Pam Cole of Keeping it Simple and she was willing to quilt it for me. IF I had quilted it myself, I had thought a grid would be nice, and Pam had a grid-like pantograph that suited the quilt nicely. Pam likes to use Hobbs 80/20 batting, so I was trying that for the first time. I can attest to the fact it makes a very soft quilt! Once home, it was a luxury to be able to just trim the quilt and get right to binding! For that, I had chosen Window Dressing in Twig & Coral from Cloud9. I confess I was in quite a quandary - I loved the fabric, I just wasn't sure it went with the quilt, but I really wanted to use it, so I just went with it. And I think it'll be just fine. The palette of this one, especially, is so different from my norm. But I like it! Something about it is soothing to me. It was definitely a bit of fun to get this point, though I'll also admit I'm glad to have it done! Another great finish and I love the daring color choice a lot!! I love the peach background! I got the book for my birthday and am itching to start my own version of this quilt! Lovely "June" finish! The peach is not one I would normally choose, but this one somehow appeals to me.....like making me want to go find some peach to make a quilt out of! love everything about this! Including the name. Great finish! It is so so beautiful! The peach is so calming! It really looks cozy. I love the Kona Ice Peach for the background. It's an unexpected color and it really works. Thank you for sharing! Talking about using new colour paletts, you made me do that in the improvstripesqal and it turned out good, just like your scrap quilt did! I always enjoy seeing your finishes, way to go! 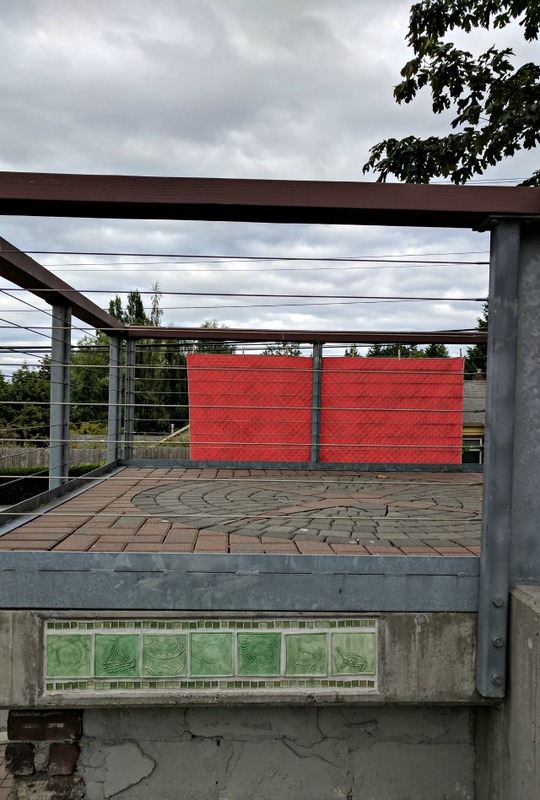 Wow, that is a huge quilt. 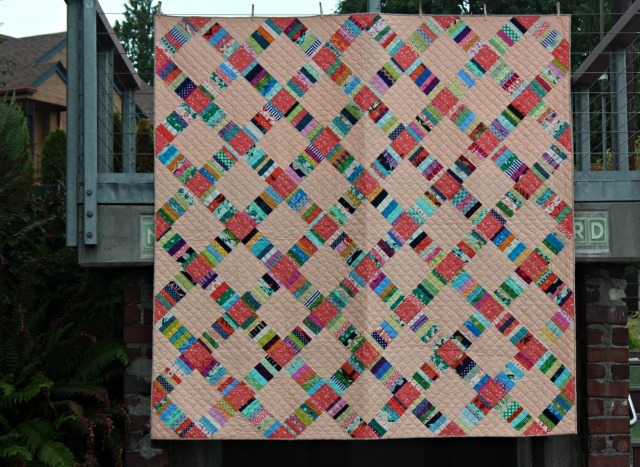 The peach is an unusual color for the background but it looks well with the scraps and makes for a lovely modern quilt. love it! love the colors you chose! Lovely seeing the peach background, different and works well. I like Hobbs 80/20, it's my favourite for hand quilting, second favourite for machine quilting to warm and natural, however it's first favourite on price as warm and natural has increased so much here over the last two years. A wonderful finish. 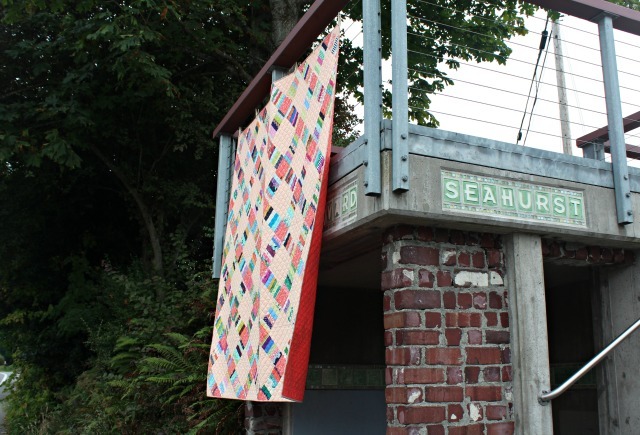 I love your June quilt and am quite envious that yours is quilted while mine still needs to be quilted. 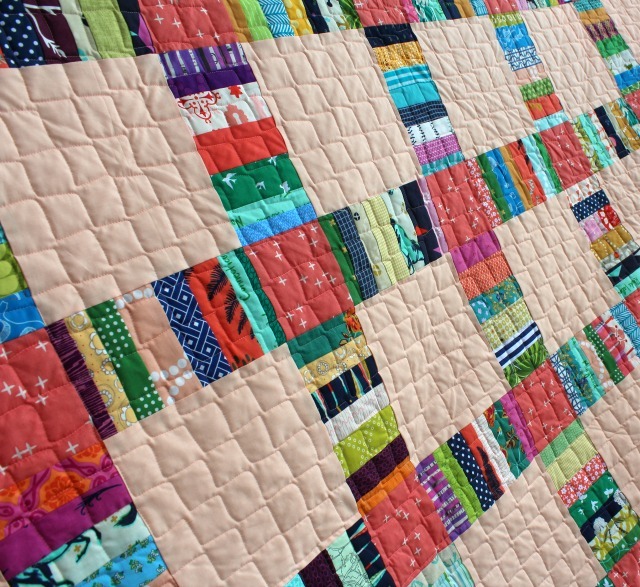 I love the fabrics and colors and the quilting just adds to the loveliness. I'll be corny and say it's a Peach. I think the binding is perfect and I really like the quilting pattern. Wish I'd seen it before I sent my last quilt to the LA. I also like the peach background; nice change from white or gray. I'm still piecing my scrappy slabs and thought I had settled on a main fabric....but maybe not. After seeing yours, my may need a lighter fabric than the brown and white gingham I had decided on. Nothing is cut yet, so no problem. I'll lay it out and see after I get a few more scrappy slabs done. I really like the peach and the cornerstone fabric is GREAT! Love it. I started sewing slabs but moving got in the way...love your background and center color choices--very calming. It turned out so lovely. You have reason to be very proud. Lovely quilt Debbie! I'm fascinated by the way you've used the pink as your background hmmmmm.... I love it when a quilt makes me mentally rummage through my stash! Superb, everything about it, I think the binding fabric is just right. You're on a roll, Debbie. The colors are divine! What a pretty quilt! This quilt is gorgeous!! Love all of your fabric choices, right down to the binding. The Kona Ice Peach background really lets all the other scraps shine. Beautiful! What a beautiful quilt! Your color combinations are wonderful. Love! Congratulations on this huge finish Debbie ! I've never done such a big quilt ... 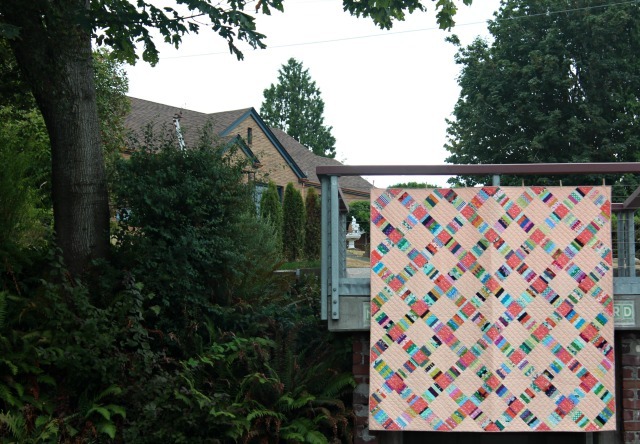 The binding fabric is just perfect for it and the quilting stands out beautifully against the peach background. What a daring and interesting choice for the background -- and it really sings!!! 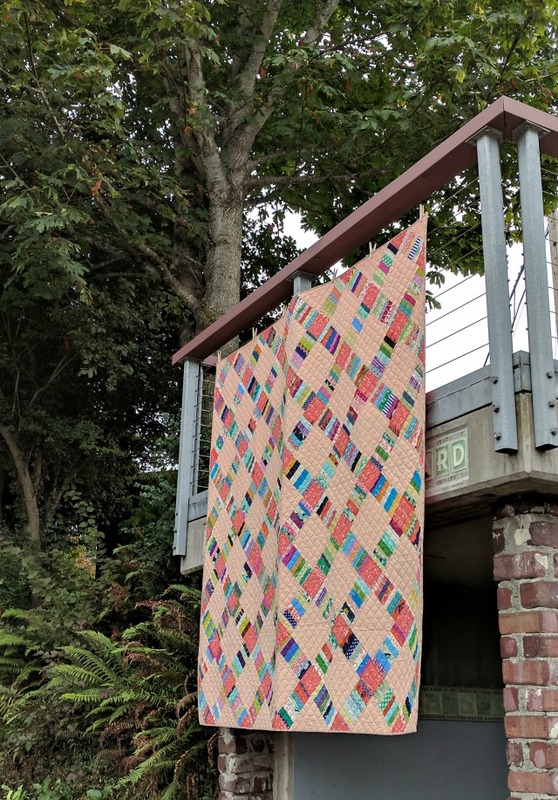 And I love love love the Wink from Birch fabrics -- I had some of it myself in a few different colors and finally cut into the first of a couple of them as I start to undertake the crosscut quilt! Anyway, indeed while this is not your usual color palette, it is absolutely gorgeous, and you should be so proud!!! 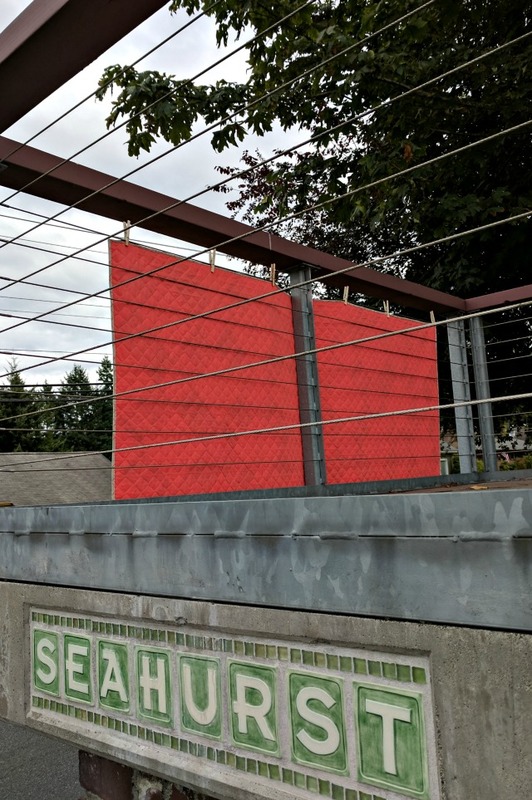 What a cool pantograph pattern! I love how the backing supports the top of the quilt and compliments it. Beautiful finish! Gorgeous finish! I love the peach background! I love this quilt! The colors are just gorgeous! You have the most beautiful scraps! Fabulous, Debbie - I love all of your unexpected choices. They all add up to a really special quilt.